This is an incredible achievement for the youngster from the Czech Republic, and surely a sign of great things to come. What is most impressive to me about this news is the fact that Alex Huber did the first ascent of Open Air back in 1996. Huber originally gave it a grade of 9a, or 5.14d. 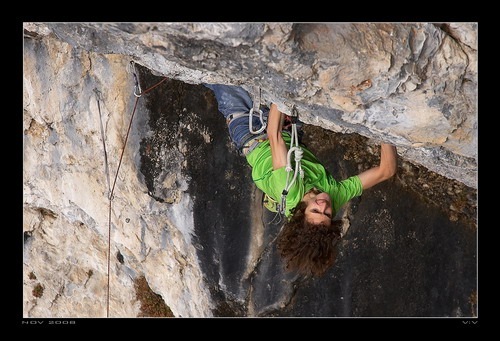 Ondra, however, has suggested an upgrade to 5.15a. This he based largely on the widely accepted benchmark of Action Direct as 5.14d. Let me give you an example: Adam confirmed my thoughts about “Weisse Rose”: it’s harder than “La Rambla”. It’s a fact that La Rambla increased in grade from 8c+ to 9a+. Often people believe this is due to the route extension, but in reality the difficulties do not change substantially with this extension. The difficulty in traversing from the Rambla belay rightwards to finish up “Reina Mora”, compared to the crux on La Rambla, is not relevant. To this you also have to add the fact that La Rambla isn’t harder than Action Direct and therefore cannot be harder than 9a. In 1995 Action Directe was given 8c+, that is why my routes such as “Weisse Rose” and “La Rambla” had to be given 8c+. Nowadays Action Direct is considered to be the benchmark 9a, so both “Weisse Rose” and “La Rambla” turned into 9a. And if you take Action Direct as a reference for 9a, then I believe many current top routes are considerably overgraded. Also worth noting is the effect that both the internet age and media publicity have had on the public perception of what are the hardest climbs in the world. Chris Sharma’s ascent of Realization has been hailed as the world’s “first 5.15” in print and in films since he first completed it back in 2001. Contrarily, and for myriad reasons, Huber’s ascents of routes like Open Air and the unrepeated Om (5.14d/5.15a??) in 1992 were largely ignored in recent times. This topic is especially pertinent given the recent ascent of Jumbo Love (5.15b) by Chris Sharma. Headlines on the cover of the most recent Urban Climber read “5.15b now exists…the climbing world reacts to Chris Sharma’s Jumbo Love, the hardest route ever” and likely a feature in an upcoming Big Up film both play up the hardest route in the world angle. It’s probably true, but the point is that nobody really knows. Sharma’s ascent is groundbreaking, amazing and awe inspiring to be sure, but in this sport where several of the potentially hardest routes have yet to be repeated, questions still remain. How can it be determined if the supposed hardest route truly deserves that title until other routes have been repeated and a proper consensus is reached on their grades? I guess it is important to keep that in mind and keep everything in perspective. omg the media making grand claims for the sake of selling stuff??? it’s REVOLUTIONARY! sure the mags have a basis for claiming chris’ ascent is the hardest… he decimated standards in europe and FA’d long standing projects… so by comparison, his game is at a higher level so something at his absolute max probably is the hardest… but comparisons are only as good as the sample size and duration of the experiment. really the debate is as pointless as rock climbing itself, but yet it can be just as captivating. more and more i have been respecting the comment by an author unknown to me that climbing is pointless, but a tremendous way to pass the time. nothing more. nothing less. the ‘hardest’ routes. the ‘hardest’ boulder problems…. just another act in the human comedy to give purpose to our sincere, yet pointless struggles and trying to make a lasting mark in the sand. Great minds thinking alike? I posted a very similar response to the Open Air ascent in my blog yesterday morning. 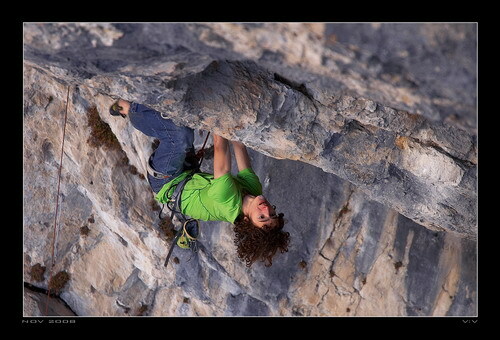 The effect of media distortion and omission is a major issue in such a subjective sport as climbing. distortion and omission sell. unfortunately, our sport is underfunded enough that blood must be squeezed from every stone. the concept of progression in difficulty is what drives the value of “news” and thus grade inflation, as it circles back on itself and the snake begins to swallow its own tail. It’s been mainly the Americam climbing media presenting Realization and Jumbo Love as the first of a new grade. There have been other routes at those grades before, editors must have known. And surely we all know, coz it’s all over the internet that harder has been climbed before. But hey, it sure looks good on the cover ‘Sharma sends worlds hardest’, now doesn’t it? When Realization (or Biography as it was called by the guy who’s bolted it) was climbed Oruju and Akira had allready been done years earlier. Realization is a beautiful line for sure, and impressive, but probably not a new grade. Note that Pringle has it as 9a in his scorecard on 8a.nu – maybe it is just a difficult 9a. And Jumbo Love the worlds first 9b? When there’s several proposed 9b routes allready? Take a look at http://andradalista.blogspot.com/ for the hardest (well, most of them anyway) routes in the world. As for the worlds first 9a+, there are still several possibilities: Om, Akira, Oruju, Realization, or maybe even Im Reich des Shogun. Only time will tell. And guys like Ondra, Sharma, Rouhling, Usobiaga will eventually find out how routes compare to each other. So instead of labelling a new route the hardest in the world, why not call it a bloody good effort or a stunning and hard line. No need for claiming hyperboling it. There are some very hard routes that have not had an repeat ascent in years. Maybe one of those routes was the worlds first 9a+ or 9b. Looks like Ondra is well on his way to find out. Be patient. About the possibilities for first 9a+, there aren’t really that many. I don’t think there’s any doubt “Akira” (FA 1995) is at least 9a+, meaning you can definitely remove both “Realization” and “Im Reich des Shogun” (FA in 2000) from the list, but I’d add the possiblity of “Action directe” being up there… Why not?